Expert Supervisor: RNDr. Jaroslav Žádný, Ph.D.
Racemic mixtures resolution is playing an important role not only in pharmaceutical industry, but also in the field of material chemistry, for example in optoelectronics. Although there is a plenty of commercially available stationary phases, their selectors are overwhelmingly based on sugar derivatives. New chiral selectors based on natural compounds or on so far unused helically chiral molecules (see the fig.) will be studied within this ambitious postgradual project. The work will be focused not only on design and synthesis of selectors as themselves, but also on preparation of stationary phases, fabrication of functional prototypes of HPLC columns and testing their efficiency on selected model substrates. Polyaromatic hydrocarbons, especially [n]helicenes and [n]phenacenes, exhibit a number of interesting physico-chemical properties. Thanks to them, they can find applications in a wide range of research disciplines, especially in optoelectronics and sensor design. 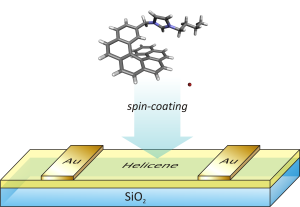 Here, new helices/phenacenes-based materials are applied in the form of thin films. The easy immobilization of these molecules by coating techniques or electropolymerization opens a wide range of potential applications, for example in the construction of optoelectronic devices such as (CPL)-OLEDs/OFETs, or the construction of sensors for biomolecules sensing (see Fig.). Within this ambitious project, new molecules and their layers with the desired properties will be designed, synthesized and later characterized. Církva V.: Microwaves in Photochemistry and Photocatalysis. In book: Microwaves in Organic Synthesis, 3rd Edition, chap. 14. (de la Hoz, A. and Loupy, A., Eds. ), pp 563-605, Wiley-VCH, Weinheim 2012. Ability of independent work, creativity, active attitude to work.